Objective: The sankalp se sidhdhi programme (New India Manthon 2017-2022) was organised for the taking oath on doubling of farmers income by 2022. This events was organised at Education City Auditorium Hall Jawanga, Geedam, Dantewada (C.G.) by KVK Dantewada. More 2707 farmer, Janpratinidhi, officers from different allied departments of dantewada district were participated. The Chief guest of the programme was Hon'ble Shri Kedar Kashyap, Minister of Chhattisgarh for Tribal Development and Minority Welfare Department and School Education under the Chiarmanship of Hon’ble Shri Dinesh Kashyap Member of Parliament, Bastar Govt. of India. In this programme videos on agriculture, patriotic etc. were played and Lecture given by agriculture and allied departments. Image: Dignotires on the dies on the occasion of Sankalp se Sidhdhi Programme. 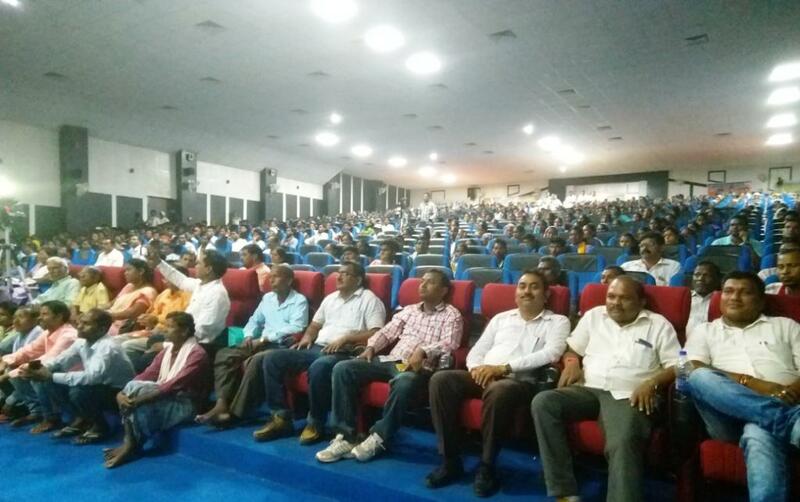 Image: Audience on the occasion of Sankalp se Sidhdhi Programme.